Tarek and Christina El Moussa are savvy house flippers—and the latest “Flip or Flop” episode reveals just how street-smart they are when they figure out what one home seller was desperately hoping to cover up. 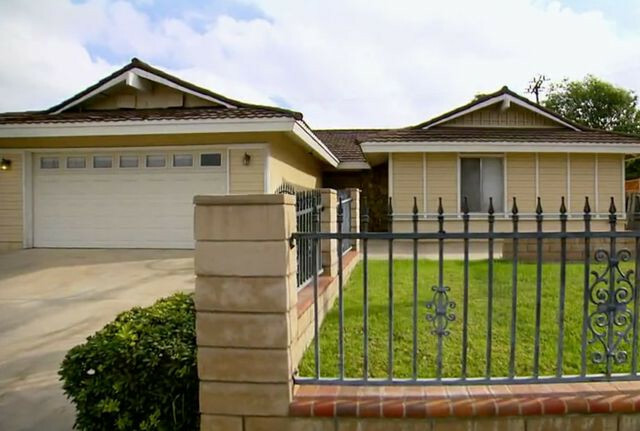 In the episode titled “Fantastic Flip,” the two walk into a five-bedroom, two-bath, 1,700-square-foot house in Costa Mesa, CA, listed at $600,000. It looks great, but the one thing that troubles them is that in every room, electric fans have been plugged in and are whirring at top speed. Tarek fears these fans signal that the house may have water damage from a leak, which the owners are trying to dry up. Upon closer inspection, though, they see that the fans are actually set up to blow out a foul pet odor that permeates the entire home. Nice try, sellers! Since Tarek and Christina are going to get rid of the carpet and repaint or replace every surface, the pet stink is not a big issue. Nonetheless, it’s the perfect bargaining chip. With some tough negotiation, Tarek gets the house for $30,000 below asking price. That’s a great deal, but they also have the massive task of bringing this ’70s home into the 21st century and making it appealing to what Christina calls Costa Mesa’s “hipster” buyers. They estimate the renovations will cost around $80,000, and in a market where the comps are around $750,000, the profit margin might be slim. It also doesn’t help that these former spouses battle endlessly between using fancy materials that Christina swears “buyers will love,” and coming in on budget so, as Tarek argues, they can make a tidy profit. Can they strike the right balance that’ll reel in those hipper-than-thou home buyers? There’s a brick and pointy steel–pole wall around the front yard, which looks dated and even jail-like. They’d like to demolish the whole thing, but it’s not that simple: The large bricks at the base are supporting the entire front yard. Without them, the yard would crumble into the street. So Tarek cleverly removes the steel poles, and replaces them with horizontal planks of wood, stained to look like redwood. It provides oodles of privacy, and looks very chic. Calling all hipsters! After: Stained-wood planks replace the steel points. Ever wonder, in your effort to create the ubiquitous open floor plan, how to find out if that wall you’re planning to demolish is load-bearing? Contractor Jeff Lawrence shows us that a trip to the attic can be very revealing. From there, you can tell exactly what, if anything, those vertical beams below are supporting. This time, Christina and Tarek are in luck, as two of the walls they intend to take down are non-load-bearing, and the weight the third supports can be taken care of with a long, sturdy ceiling beam. Since the new kitchen has a relatively standard layout with no unique curves or angles, Tarek and Christina decide to save some cash and order prefab cabinets that can be assembled and hung on site. Christina finds a lovely, dark-gray sample, and they both decide it will look elegant. Unfortunately, when the cabinets arrive and much time and effort have gone into putting them in place, Christina notes that there’s a lot of brown in their dark-gray hue. In fact, brown seems to be the predominant color, a fact she didn’t realize from the small sample. Bummer! 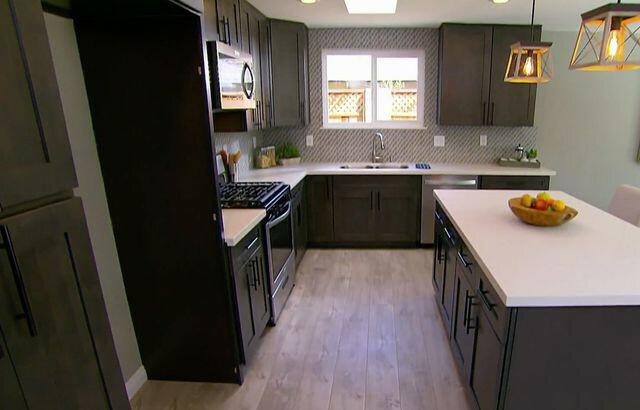 Christina is upset that Tarek didn’t notice it sooner, but Tarek says rather than tearing them down and ordering new ones, they can remedy the situation by using a patterned backsplash that will (hopefully) bring out the cabinets’ gray tones. While Tarek wants to simply paint the ugly rock fireplace white, Christina says that will look tacky, and suggests covering it with wood-grain porcelain tile in a chevron pattern. Tarek, of course, balks. “Extra labor! Extra cuts! Extra cost!” he cries. This time, Christina wins: The chevron pattern is in. When there are five bedrooms to stage, potential buyers understand that you don’t need to put a bed in each room. Tarek and Christina opt to stage one as an office, and another as a den. All have windows and closets, so they’re official bedrooms, but it’s nice to show that the home you’re selling is versatile. Not everyone has that many kids, or that many guests sleeping over. So is it a flip or flop? 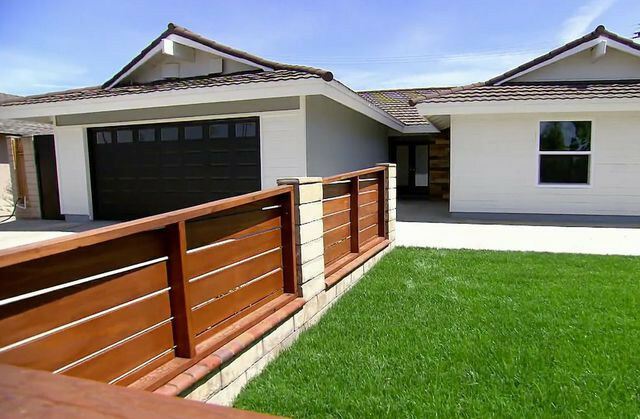 Although there aren’t any major construction issues, the house is large and Christina’s taste is expensive, so they end up spending $97,000 on the renovation. Even though the comps are around $750,000, Tarek decides to swing for the (horizontal) fences, and lists the home at $829,900. It eventually proves to be overly ambitious. In the end, they make a hefty total profit of $113,900, proving that they’ve got what it takes to balance pretty with profits—all without having to hide a thing (take note, home sellers! ).